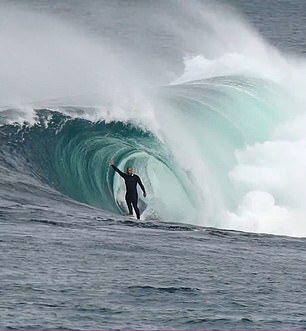 Three fearless surfers have been captured on film taking on massive waves at a secret break in a remote part of the South Australian coast – but only after negotiating with protective locals. Gripping footage shows the trio, veteran lifeguards and surfing personalities Brett Livingston, Josh Dowthwaite and Jye Demmrich, taking on the huge waves. The trio had the secluded South Australian break entirely to themselves – partly because of the risk of shark attacks along the stretch of coastline. The video, shared by My Surf TV, showed the surfers being towed out to the break by a jetski and then taking off on waves of up to 10-feet. However, not everything went to plan, with a surfboard seen snapped in two, while one of the surfers also peeled back his shorts to reveal a large purple bruise across his upper and inner thigh from a hard landing. 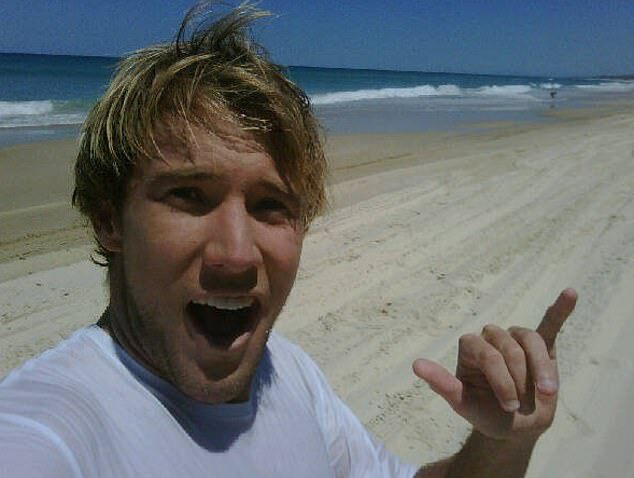 Surfing Australia spokesman Blainey Woodham told the Daily Mail the area they were surfing in can be treacherous due to its isolation, with no electricity or mobile phone reception. There was also a chance of coming across a great white shark, who are common off the South Australian coast. ‘The large waves are awesome and empty, but you definitely might have to dodge some sharks. Part of the reason for the secrecy, he said, was that the beach was heavily guarded by locals who do not want an influx of surfers from elsewhere. The trio had to get permission from the locals before they even filmed the break.